It concerns proportions and this concept is embedded into a context of gears. 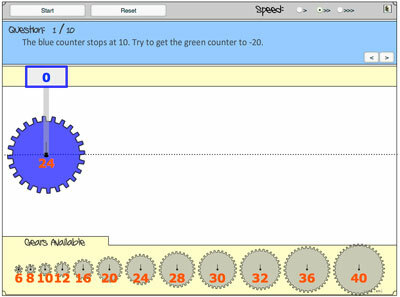 The students' task is to place several of the gears that are provided on the bottom of the screen in between the gears that are already in place. They are asked to investigate what happens, and what characteristics of the gears make a difference to the numbers that appear above the gears. This concerns the proportion between the size of the gears and the rate at which they rotate, in relation to the number of increments that are measured and noted above the gear. Students can work on the applets independently initially, without teacher guidance, but the effects of the applets can be optimized by starting a classroom discussion about the students' findings, questions and conclusions. Abstract The students' task is to place several of the gears that are provided on the bottom of the screen in between the gears that are already in place. They are asked to investigate what happens, and what characteristics of the gears make a difference to the numbers that appear above the gears. This concerns the proportion between the size of the gears and the rate at which they rotate, in relation to the number of increments that are measured and noted above the gear. Students can work on the applets independently initially, without teacher guidance, but the effects of the applets can be optimized by starting a classroom discussion about the students' findings, questions and conclusions.